Changing language requires restarting application to take effect. 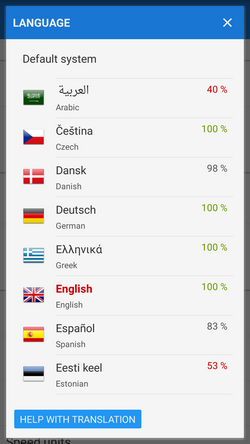 The language list displays also availability of particular languages in percents. Help with translation button in the bottom shortcuts to Locus crowdsourced translation page. If you are interested in Locus development and have proper language skills, you are welcome! Changing language requires restarting application to take effect. TTS is necessary for navigation, guidance, audio coach and other voice alerts across the app. 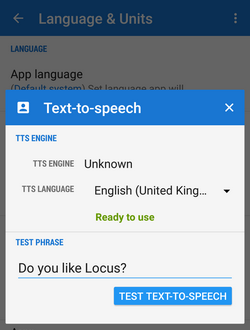 TTS Engine - select from a list of TTS software installed on your device. TTS language - each TTS software has its own language portfolio. Select your language. Functional selection is marked “Ready to use”.